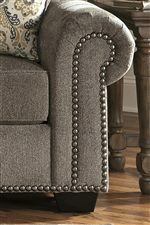 Black nickel finish nailheads add a dressy detail to this plush sofa. Its memory foam queen-size mattress is ideal for hosting overnight guests with ease. The sofa's three loose seat cushions feature premium coil seating for increased comfort and durability. Complementary fabrics on the five soft accent pillows bring playful style to the sofa. Rolled arms and cozy flared back pillows complete this sofa. The Emelen Transitional Queen Sofa Sleeper with Nailhead Trim & Coil Seating by Benchcraft at Michael's Furniture Warehouse in the San Fernando & Los Angeles area. Product availability may vary. Contact us for the most current availability on this product.